Tina finds a home. And a friend. Today we said goodbye to lovely Tina. This tiny little dog arrived at the end of August, and our first thought was that someone would be along to collect her. Not only is she small and affectionate, she arrived with a brand new collar. Someone must have loved this dog until very recently. 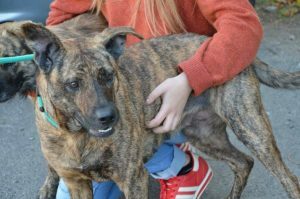 She hated being alone in her kennel (unavoidable for the first ten days while dogs are in the Pound, for hygiene reasons) and would fling herself at anyone who came to visit, desperate for a cuddle. 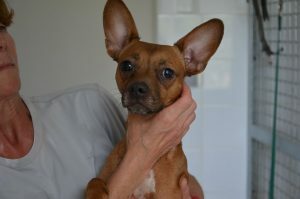 Sadly for her, she was not identified, so the ScPA had no way of contacting her owner. When will people learn that this is one of the best ways to find a lost dog, as well as being the law. Once out of the Pound, Tina went to share her kennel with poodle Pompom, and has been on walks with many different people. Always in the hope that maybe this time she would not be going back to her kennel. Putting her back has not been easy, and the look in her eyes each time has caused more than a few sleepless nights. Puppy Isaac (now Charlie) was adopted in mid June, and for a month or so his mum, Jane, has been looking for a new companion for him. Today she asked to meet Tina, and like everyone else who has met her, she was smitten. The two dogs seemed to like each other too, which of course is key. We know that Tina will have a lovely time, and she definitely knew that her luck had changed as soon as she snuggled up in the back of Jane’s car. We look forward to news and pictures of this lovely little girl who will be so delighted to have a new home where she has two new laps to sit on, and a friend to play with. It always great when we have multiple adoptions to report and today we have 4! Bouba, Funk, Milou and Marcelou have all been adopted! I am so delighted that little Bouba has found a home. He arrived with his mum in January and was sad when his mum was adopted. We of course found him some new friends, but I am glad that today he found his forever family! Milou 2 as we called him as we already had a fox terrier called Milou left next. 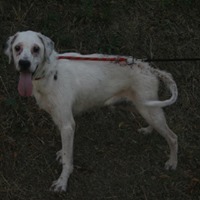 He arrived at the beginning of August in a sorry looking state, He had an allergy to flea bites but once this was treated soon regained his handsome looks, A lab/dalmation is a lovely cross and we wish him all the best with his new family. 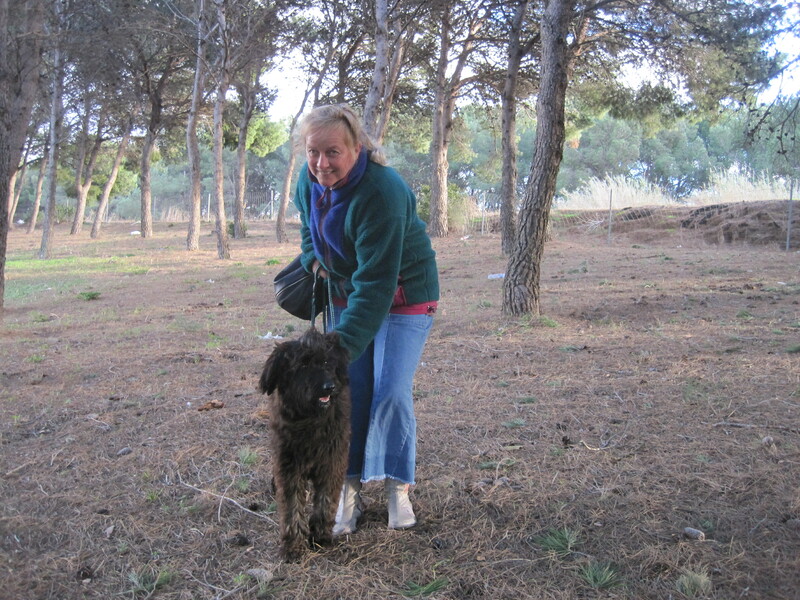 The next to leave was Breton spaniel cross Marcelou. 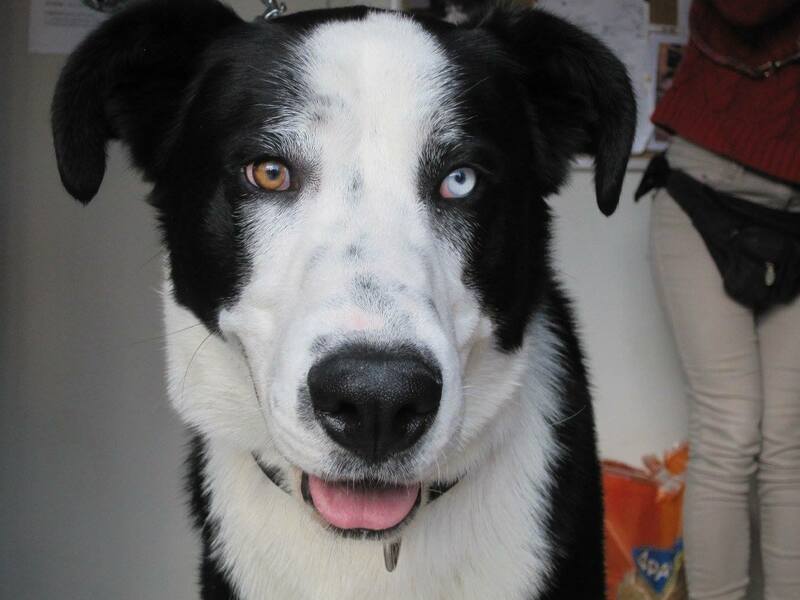 He was a very loving , happy boy who really needed an active family. Yesterday his perfect family came along and off he went. Dont forget that this Sunday afternoon we are open so do feel free to pop along, say hello , walk some dogs or cuddle some kittens! 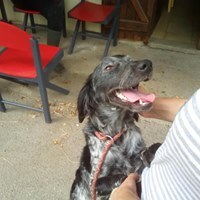 Today I was up early to walk my dogs and then leave for the refuge for 8am to collect Duchess who I took on day 1 of her journey to a lovely family in Prevessin Moens, near Geneva. I handed her over to Muriel, one of our long-time supporters and tonight Duchess will stay with Muriel and family who will take her all the way to Prevessin Moens tomorrow. 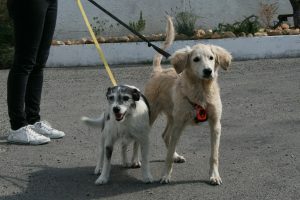 We know Terri and Michael, Duchess’ new family well as they have already adopted two dogs from us. The first was a very handsome collie cross called Dyson and the second was a lovely griffon cross called Aimee. Both these dogs are now at rainbow bridge, so it was great news that they were not only adopting from us again but trusted us to choose their dog for them! Duchess has no idea what a great active life awaits her in the Alps. Terri who works part time has cleared her schedule for the whole of July and August to settle Duchess in. I can’t wait to see photos of her in the mountains. Muriel and her mum and dad have transported lots of dogs for us. They also have one of our older dogs Woofie ( ex Tayson) and are very experienced handlers. Many thanks to them for giving up their time to help us out yet again! This afternoon Barney was adopted by a super couple who live near the coast. They have only been in France a couple of months and they too are very experienced doggy people. In the Uk they ran a home boarding facility. 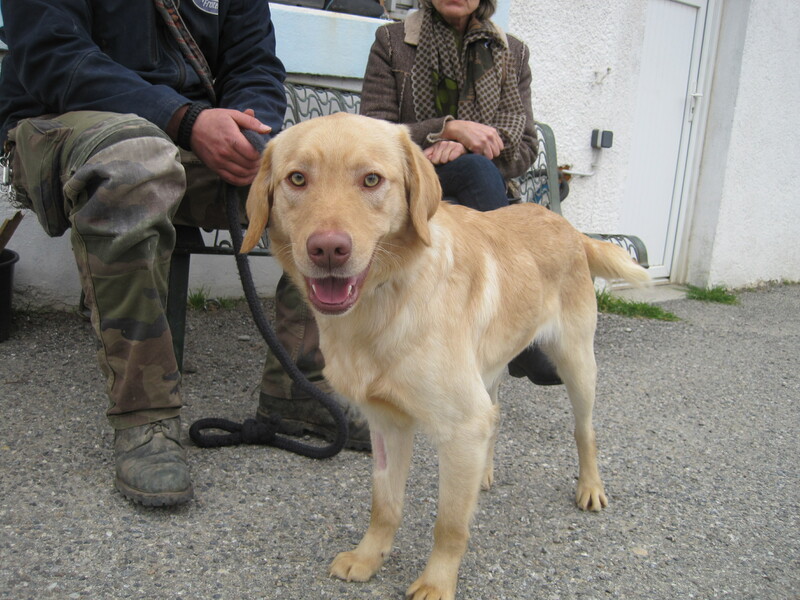 They came to us for a doggy after losing their older Labrador just before coming to France. Barney now has the chance of a happy settled life which is very different to what he has been used to. 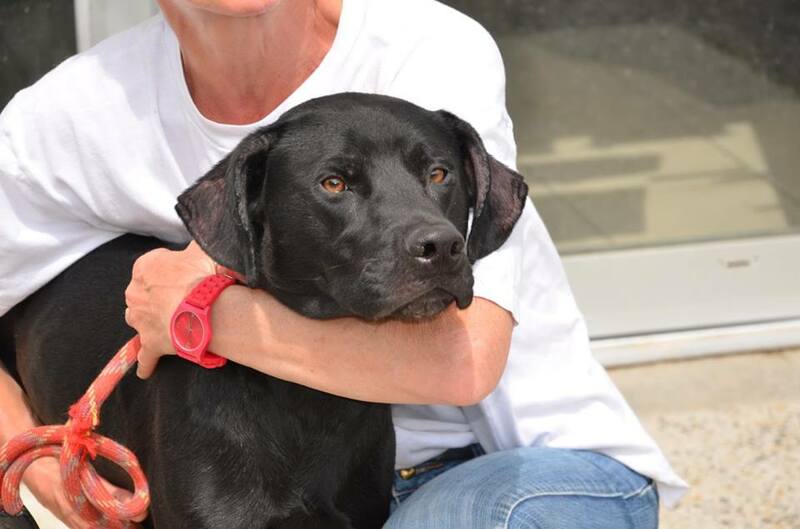 Once he is settled they will adopt a friend for him……what a lucky lad! The next to leave was puppy Pimprenelle. She arrived with her sister Nicky who will now be alone. Lets hope that she doesnt have too long a wait! On a not so good note, little Candy is back. 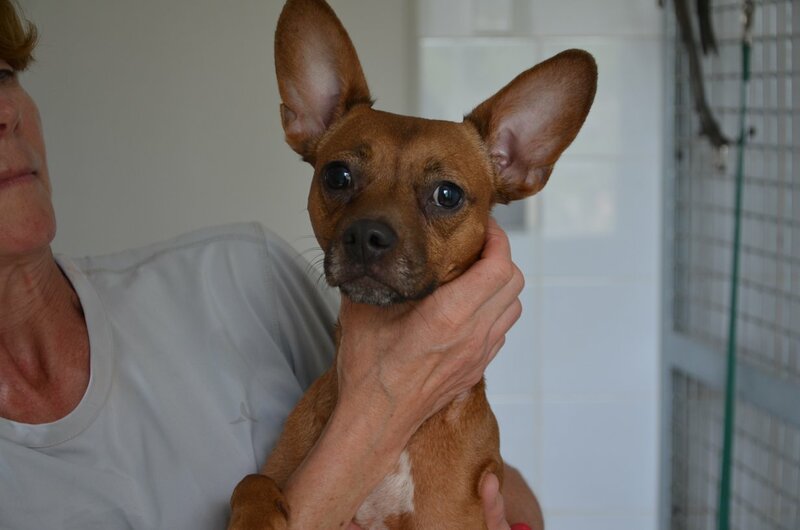 This little pinscher arrived at the the refuge with 2 pups Sugar and Spice. She was adopted quickly but this was not to be and so is once again available for adoption. 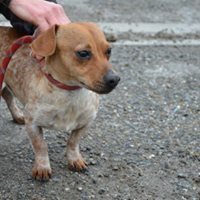 Candy is looking for a new home. We had a fabulous day today with lots of sunshine and lots of walks; it was another day when almost all the dogs went out, and so thanks to the ever-growing number of volunteers, and of course Sebastien who is the official volunteer-wrangler! And we had some adoptions, too. First to leave was little Nino. 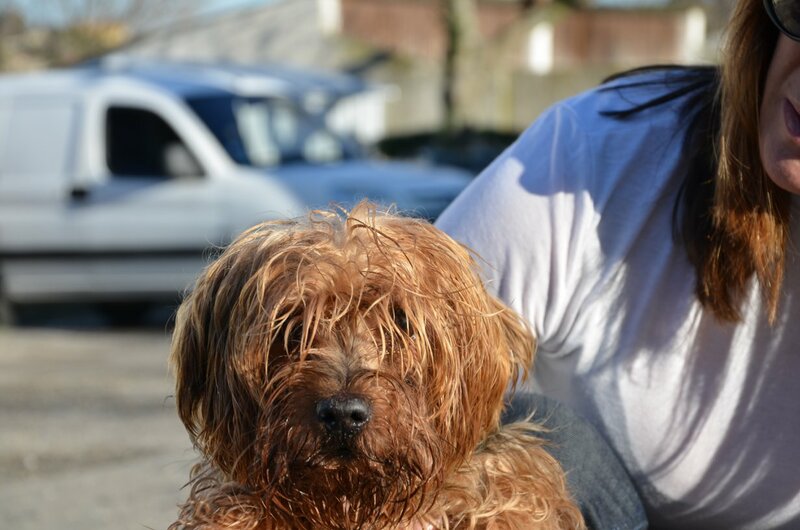 This tiny ten year old yorkie arrived identified but to an address in a department far far away. All attempts to find his owner have failed, and believe me, there was lots of effort made. The time came to find this little lad a home. And today a family came to meet him and took him home. We then said goodbye to Otto. He is one of two dogs who was left to starve in an appartment when his owner moved house. Yes, this actually happened! Luckily the landlord went to collect the rent arrears and saw the dogs. They were brought to the SPA and that of course will not be the end of the matter. However as far as Otto is concerned, it IS the end as he has a new life. 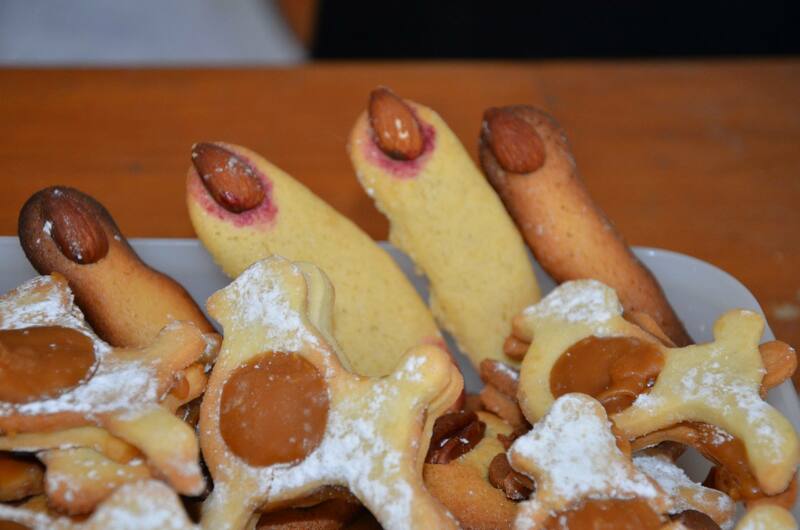 We hope that his father, Gustav, doesn’t have long to wait. 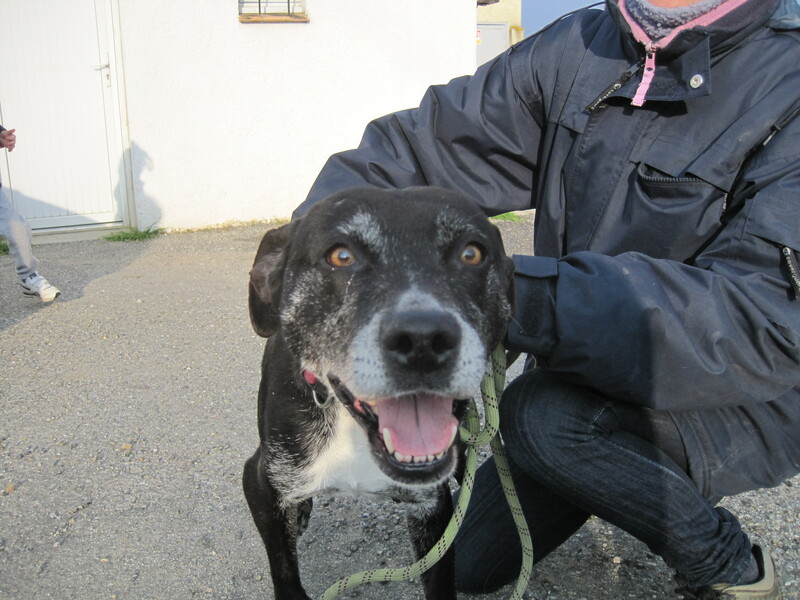 Dana, an elderly dog who arrived fairly recently, was reclaimed as well, so it was all good. Although after yesterday’s blog was posted we did have some sad news; one of the family’s huskies refused to accept poor Texas, so this lovely lad is back at the SPA. Let’s hope he finds true happiness soon. The SPA is shut tomorrow, but it will be open next Sunday, of course, and there is talk of a mass walk taking place, too. Adoption of Brenda and Méli is back home. Today Brenda left for her new home together with Peter and Hilary and their ex SPA griffon Benji. In fact this lovely girl was reserved in December, but for various reasons her new family was unable to take her until today. 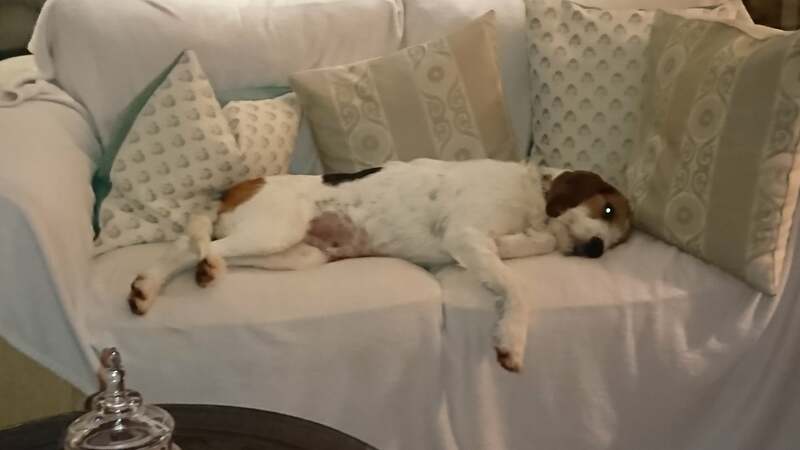 Many of you will have realised that she has not been at the SPA for several weeks and for that we (and she) have to thank foster family Debbie and Andrew who took Brenda home so she could recover from her sterilisation in the warmth of their home. And, (judging from the photos) the comfort of their sofa! We weren’t able to perfectly match up dates, which meant a weekend at the SPA for Brenda. However the lovely staff managed to find her a spot indoors, so clever Brenda probably knew something was up. Today she left for her new life, and we are sure she will be very happy. She is a lovely girl and Debbie and Andrew became very fond of her, despite her Houdini tendencies! 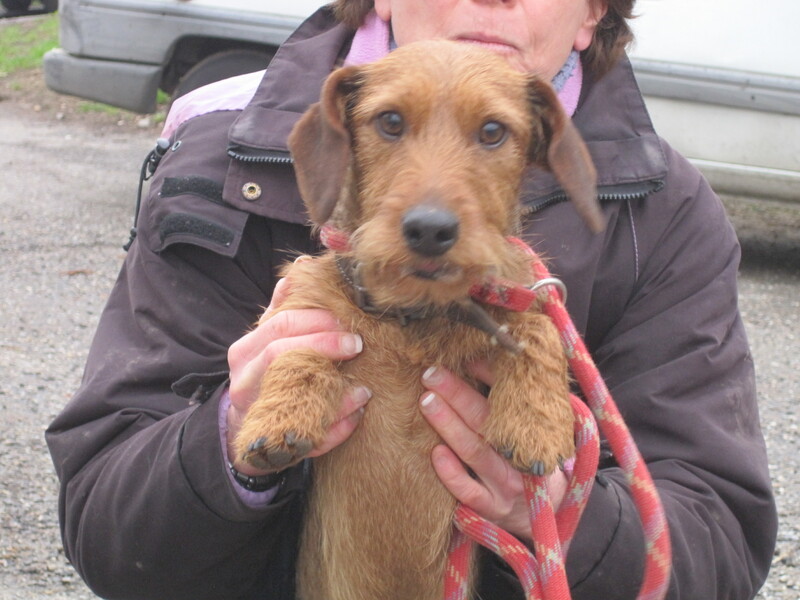 Many thanks to them for looking after Brenda so well and to her new family for offering her a permanent home. In other news beautiful Méli was reclaimed. She had been with us for almost ten days, and there was a wonderful family waiting to adopt her, despite the fact that she had been diagnosed with a heart condition. 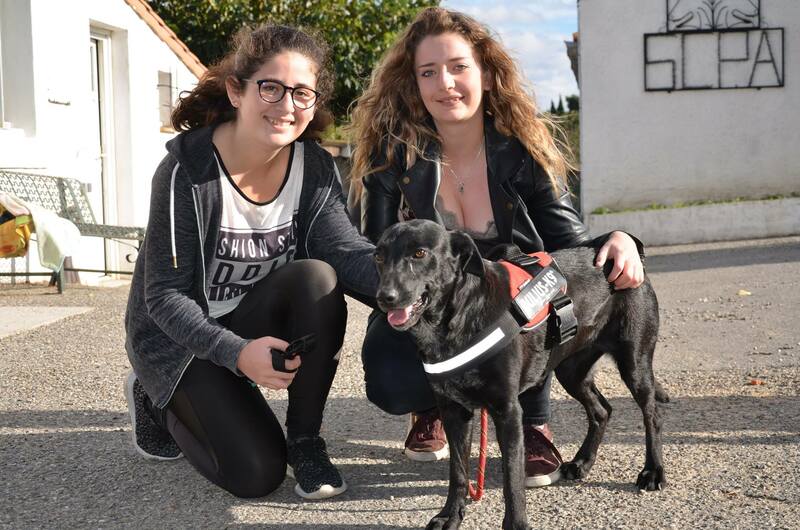 On Saturday a woman phoned from the Var; her dogs (both identified) had been stolen in August, and Méli bears a strong resemblance to the younger of the two. Today she drove all the way to see if she recognised Méli close up, not just on photos. So the good news is that Méli is now re-chipped (perhaps this happens more frequently than we thought?) and has gone back home. This is of course what we wish for all our “found” dogs, although it is hard for the family who had offered her a new home. 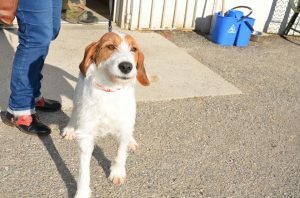 Another dog, Saturday’s arrival Magnac, was reclaimed yesterday, thanks to Estelle who prefered to give up some of her Sunday than leave a dog wait another day for the SPA to open. More good news like this please. Let’s make this week a better one than the last one! It is inevitable that some dogs should find it easier to find a home than others. Yesterday’s arrival, N’joy has been a real hit, with dozens of people expressing interest in her immediately her picture was put on Facebook. Other dogs are not as lucky. Take Popsye, for instance. This young griffon cross arrived in August of 2017, and had she been a normal dog, we could have rehomed her ten times over. 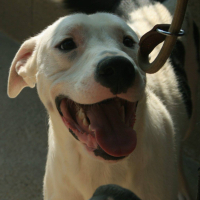 But Popsye has a problem that makes finding her a home almost impossible. As a result of (presumably) being hit by a car, Popsye is incontinent. And in the worst way. So despite the fact that she is absolutely adorable, as well as being good with dogs and cats, the SPA was at a loss as to what to do with her. Of course Popsye could spend her life at the SPA. She shares her box well, and everybody loves her. She gets regular walks and regular baths. But she is only two years old, and this is really no life for her, not in the long term. So what to do, what to do? Answer: Try and find one of the many many incredible associations out there, one that is specifically set up to deal with dogs like Popsye. This afternoon Volunteer Petra and I took Popsye to meet her new foster mum. Popsye will spend a few weeks in Toulon with Dominique. There she will spend some time being assessed before moving onto the next step. 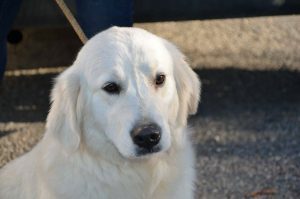 Either she will move further to Italy, to live in a family environment in a specially adapted home with other dogs like her. Or if her condition improves, perhaps she will be adopted directly. Popsye with Petra in a pine forest. This might be possible because in recent weeks Popsye has started copying her kennel mate when he (ah-hem) assumes the position, and tries to do the same as him. And sometimes she is successful, indicating that her muscles are perhaps getting stronger! So we are all rooting for Popsye to make a full recovery. But at least we know that she is going to be loved and looked after for the rest of her life, even if she always has questionable hygeine! And we are sure to have news, so of course we will keep you informed of Popsye’s progress! Popsye starts her new life! 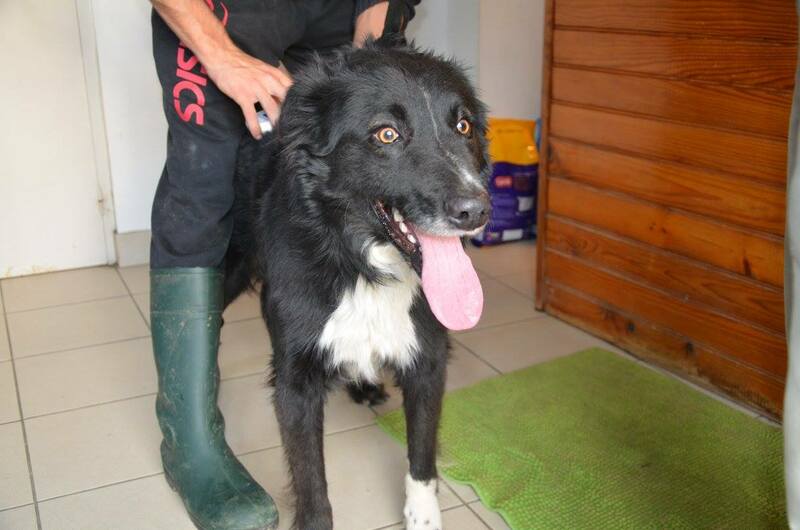 In other refuge news, one of the year’s first arrivals, Shaun, a lovely young border collie was adopted. We wish him a wonderful life and hope the other ever growing number of border collies at the SPA find homes equally quickly. 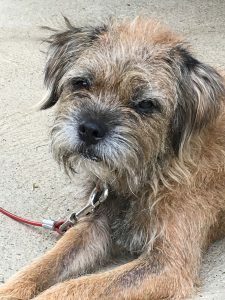 Once upon a time, there were two little Border Terriers, Gimli and Hector , who moved from their home in London to their new home in SW France. They were so happy when they arrived to find that their humans had bought them a lovely little farm, with lots of lands to run around, explore and have adventures! They settled in very quickly and soon Hector was regularly bringing mice in from the barns, happy days . 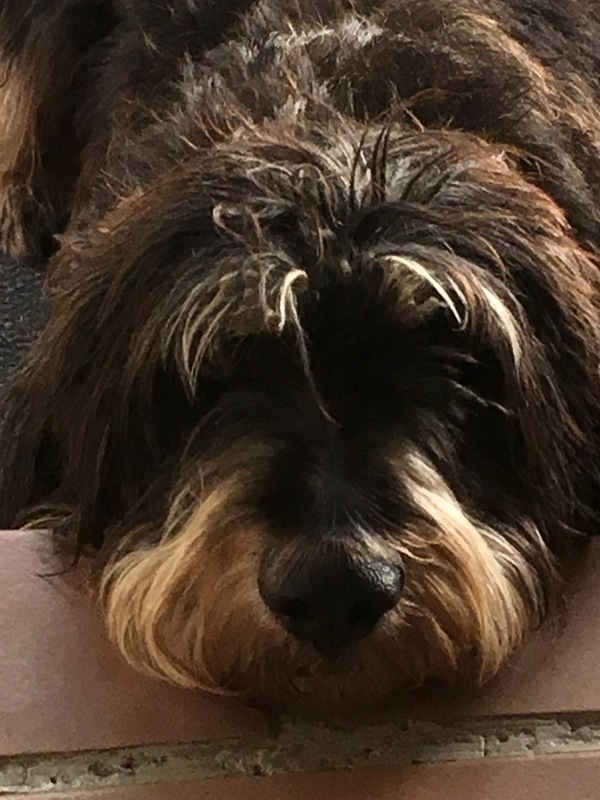 Tragically, after only 3 years in their new found paradise, poor Gimli had to be put to sleep, a chronic spinal problem, leaving an utterly devastated Hector. For over a month he pined and only left the house to do his business, leaving his humans even sadder. 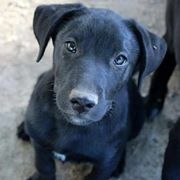 They could take it no more, so started to research adopting a puppy. 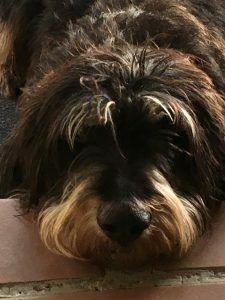 A litter of Griffons needed homing from the SPA near Bergerac and so it came to pass that Porthos came to cheer Hector up and bring the sparkle back into his life! As soon as they met, they became real buddies and they played and they played! There is a happy ending to this tale, but you’ll have to wait a bit, and you may need a box of tissues! Porthos continued to live happily enough with his humans, except to say that he had started fitting occasionally. The vets did tests but said that as he was so young he would probably grow out of them. He did n’t. One night he passed away in my husband’s arms, unable to control or stop the massive and fatal fit that just kept going on and on. Absolutely heartbreaking. And then there were none, no dogs at all, and the house was still. But we still hear them, don’t we? The humans were too heartbroken and needed time to grieve. But as the months passed, the void needed filling, so enter SPA Carcassonne ! It was time to give an older dog a new start and the story of Shadow, with his little face looking at us out of the website, had us sold! 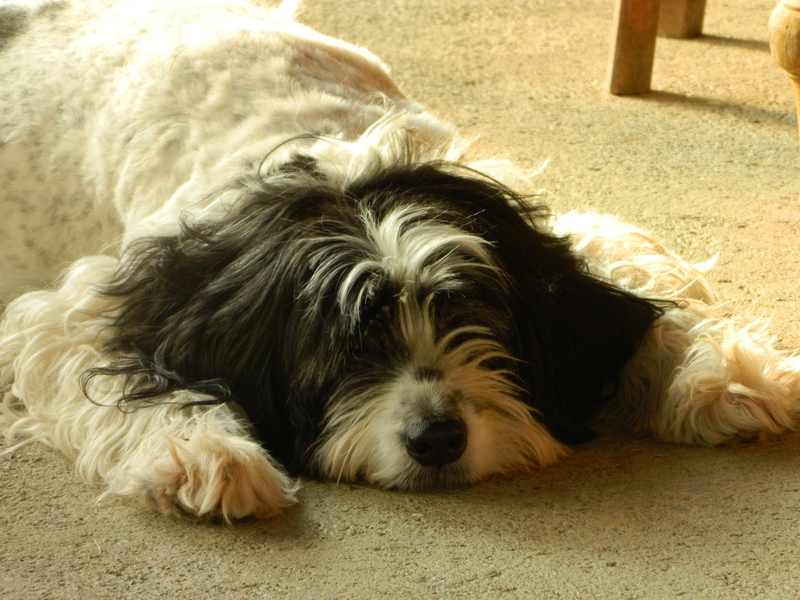 His papers say he is a Pyrenean Berger X , so he’s a medium-sized dog, and the vet said he should weight about 20kg . When we adopted him, he was just over 30kg !!! Lots of short walks and a controlled feeding plan slowly got his weight down, improved his fitness and therefore his joie de vivre! He wasn’t always the easiest at the beginning, as he was the best thief I have ever known, and once he had something in his mouth he would make a terrible noise until left to eat it at leisure – whatever disgusting object it was! He must have the most amazing constitution! Anyway, we love him dearly now and so much so, it was decided to get him a pal. 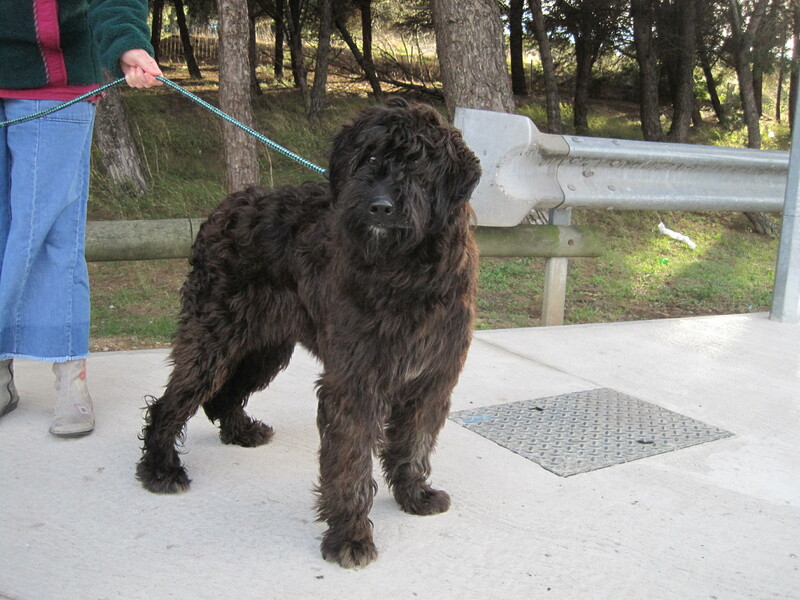 SPA Carcassonne came good again with a super young Griffon who we have named Dreyfus ! He was only just over 2yrs when we adopted him. I was always sure he was a lovely boy, but when he first came to live with us , he was incredibly timid. More of men than women. The saving grace was that he really wanted to stay close to home, to us. So when people came to the house, we would make sure that he was free to hide or come and say hello as he wished, and over time this did the trick! A good ignoring by guests was always the best way for him to find the confidence to say hello. He is an absolutely adorable chap and loving constant attention from us now, we are never alone !!!! One rainy day in May 2017 , we went up to the village for a coffee. But en route was noticed a scruffy, fat little dog in the rain, by the side of the road. I told my husband to stop the car, which he did, I opened my door and called “Hector” !!!! Within 5 seconds he was on my lap going crazy! It was our Hector! Still wearing our collar, although a bit tight as he was so fat! So, 2 years and 7 months later, we found him !!! A Chien Perdu notice appeared the next day, so I managed to find the lady who had kindly taken him in. It transpires that an elderly man had found him and taken him in, and kept him for 2 years as a lap dog and companion until he passed away. The family didn’t want the dog, so Videane offered to look after him for a couple of weeks until a more permanent owner could be found. That’ll be 7 months then! She is a really lovely lady and was delighted to get “Dog” as she called him, back to his rightful owners. She pops in regularly to say hello, and he is always very pleased to see her. So, there you have your happy ending ! We now have 3 dogs !! They all get on very well, although Hector is top dog! The really lovely thing about our two adoptees is that they haven’t got a bad bone in them, they are never aggressive and get on with every dog they meet out and about. It’s so nice never having to worry. Tonight we are all in celebration mode. 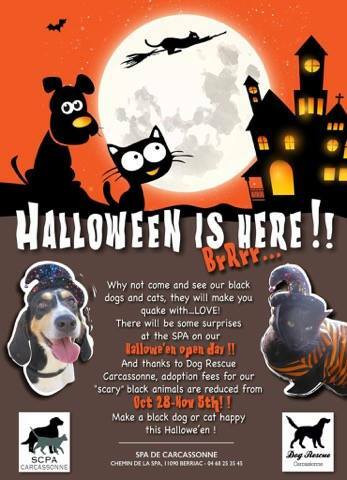 The last dog to leave for Hallowe’en is none other than Cliona. By now everyone knows or knows of this dog, who was found neglected and alone in a village in a terrible state, with huge tumours and severely malnourished. She finally made it to the SPA, luckily for her. Large medical bills awaited, and in a huge effort of solidarity many of you donated generously in order to ease the financial burden on the SPA. Yes, that is what the SPA is there for, but of course the are limits to our funding and therefore limits to what we can do. 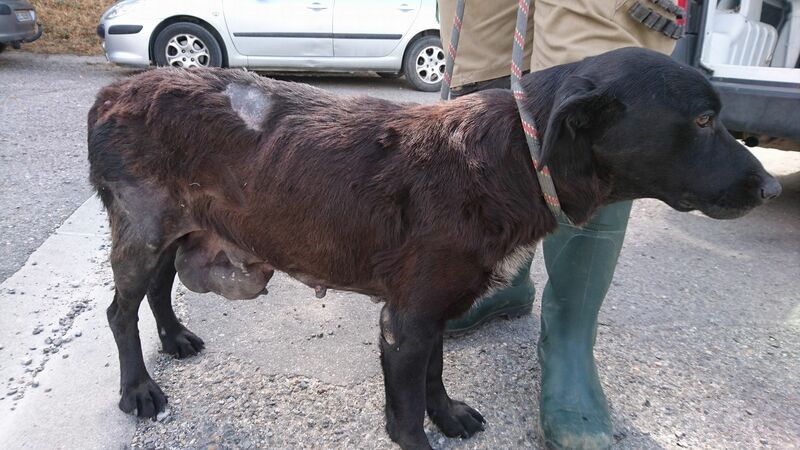 In Cliona’s case, not even the vet was sure she could be saved, but we wanted to try. After her operations were complete, we saw the true beauty of this dog. Not only did she become a magnificent looking dog, but she is also affectionate and gentle and oh so willing to trust humans, despite her weeks or months alone. Lots of people love and walk her, but since her arrival in August, no one has offered her a home. However yesterday a family came to meet her and today they returned with the good news; after an evening’s reflection they had decided to offer Cliona a home. It was an incredibly emotional moment for all those present. Cliona is much loved and in many ways represents all a good SPA (like ours) should be. And we are even more delighted that with is being Hallowe’en, Cliona, a black dog, should leave for her new far far better life. Thanks to everyone who donated to help the SPA help Cliona. Look what we can achieve together! It is truly inspiring. And thanks to her new family for offering her a home. It was a great day and tonight we are very happy indeed! Two Saturday Adoptions and a Huge Donation. Today we have two more adoptions to tell you about. 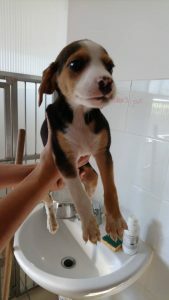 The first of the lucky dogs is Princesse, who was adopted yesterday. She and her sister Kiara were brought to the refuge at the end of October by their owner who could no longer look after them. Not only are they stunning dogs, but they are both fine with children, cats and other dogs. It was no surprise that with credentials like these, Princesse found a home so soon. In fact the SPA has already received photos of her lying happily on the floor with her new family’s toddler. 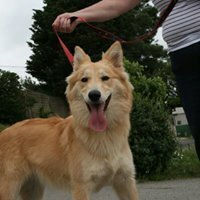 Let’s hope Kiara finds a new home soon, as well. 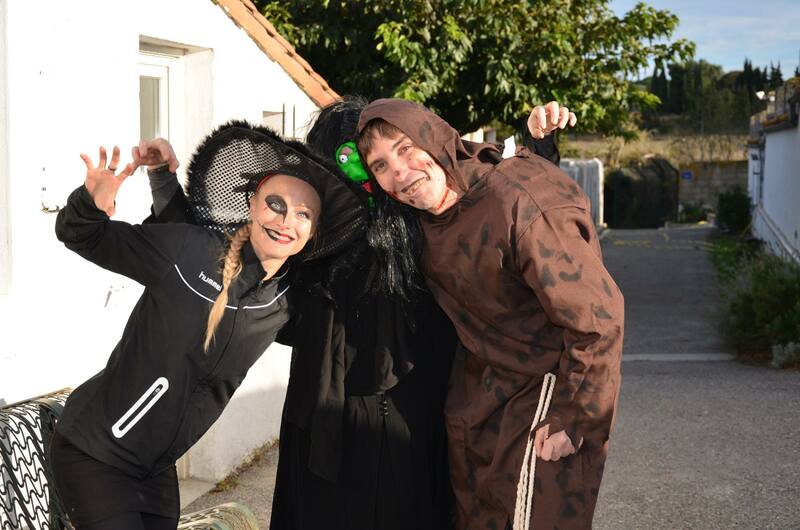 Next we said goodbye to Hallowe’en dog Denis “Piout”. This stunning border / beauceron cross has been at the SPA since mid August, but this was not his first time with us. He had visited the Pound on a number of occasions, and each time, just before the ten days were up, he was reclaimed. One of those times we had an adopter who was desperate to take him home, too, so we were very disappointed that he left. And more so when he arrived once again, never to be reclaimed. On the other hand, he is now castrated, which would never have been the case otherwise! And today he has a new home too. Also today we have to pass on huge thanks once again to the amazing team at Dog Park 11 who donated over 300 kg of dried food to the SPA. This was collected during a recent group walking event and we are very grateful to Fabrice and everyone at this fabulous local association for their continuing support. Finally please don’t forget that the SPA will be open for the first Sunday of the month tomorrow. It is the end of our Hallowe’en week, and volunteers have been discussing their costume choices. If you or your children would like to wear an outfit, you will be in good company!